Are you looking for the perfect adventure town for your outdoor vacation? A town where you can paddle, bike, and hike during the day, and indulge in some fine eatin’, strolling, and shopping as the sun goes down? Marietta, Ohio may not be on the top of your adventure-town bucket list right now, but it will be! Marietta’s unique location at the confluence of two beautiful rivers, along with its proximity to Ohio’s largest national forest and the Ohio River Islands National Wildlife Refuge, makes it one of the most scenic Midwestern communities you’re likely to come across. 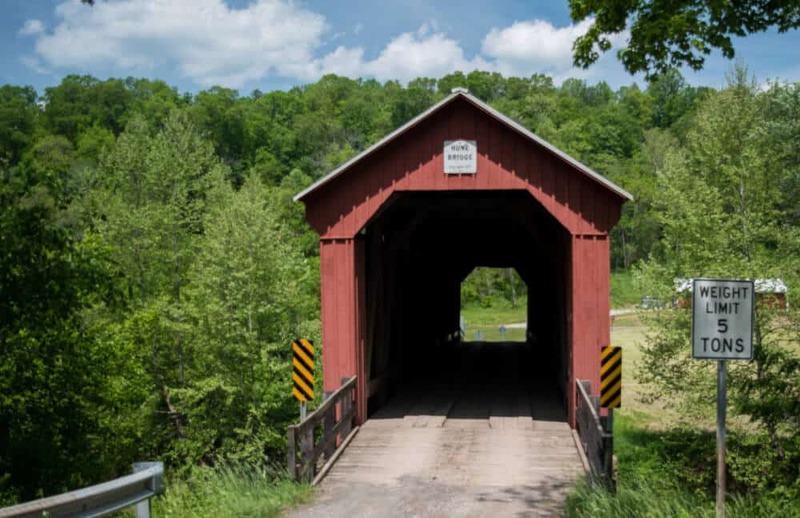 Throw in more than 30 miles of in-town trails, nine covered bridges, and a totally walkable and bustling downtown, and you’ve got an adventure destination that will keep you moving. 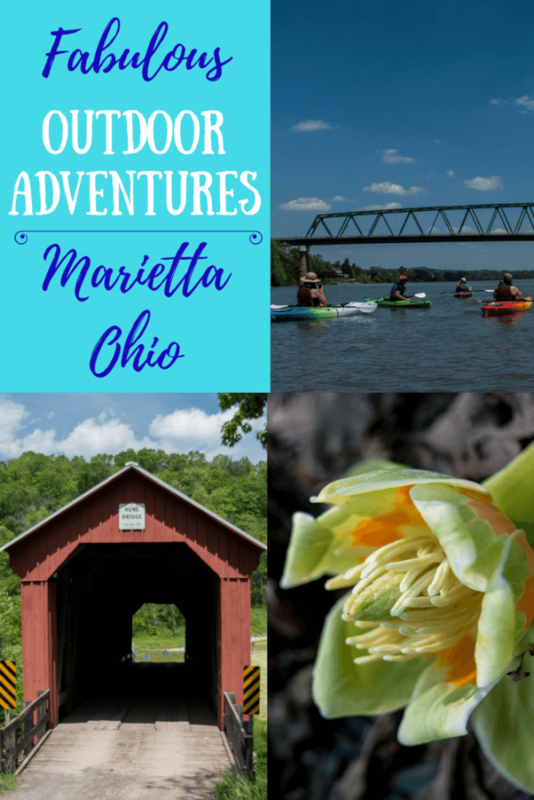 Here are some of our favorite outdoor activities in Marietta, Ohio. 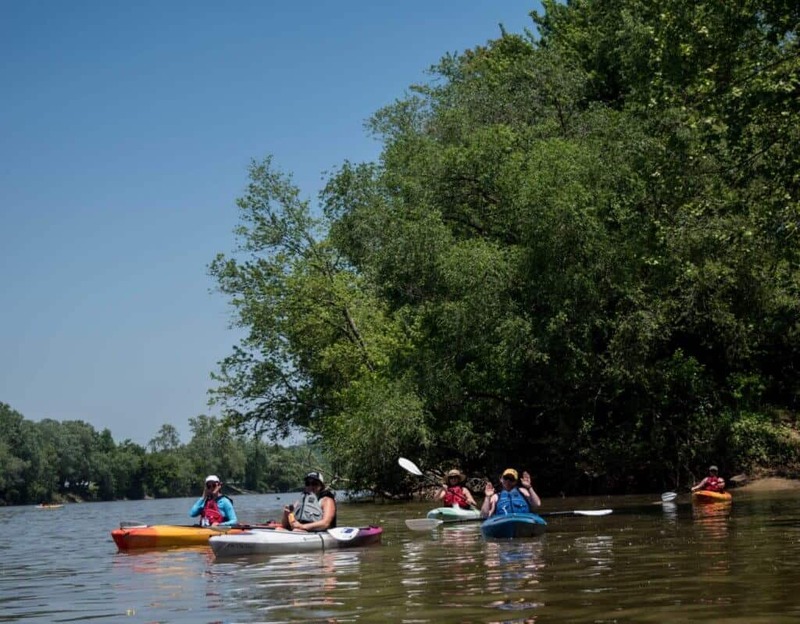 Located on Second Street in the heart of downtown, Marietta Adventure Company can help you plan the perfect outdoor adventure on land or water. Whether you’re looking for trail advice, rental equipment, or a full guided paddling tour, this is the place to go. Ryan and Hallie, who own the shop, are passionate about the outdoors and their hometown. Both grew up in Marietta and moved away as young adults to explore the outdoors in other parts of the country. Marietta, and its own opportunities for adventuring, drew them back before too long. 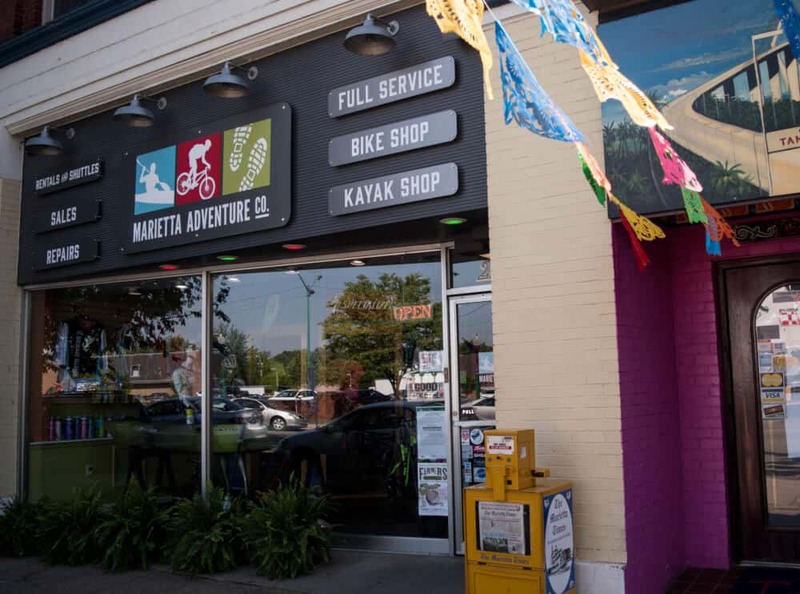 In 2011, they opened Marietta Adventure Company, and have been inspiring locals and visitors to explore the outdoors ever since. We were lucky enough to embark on two guided tours with Marietta Adventure Company during our stay. Their passion and enthusiasm for the outdoors was definitely contagious. The overall consensus is that you can’t visit Marietta, Ohio and not get out on the Rivers. This city was founded on river travel and commerce, and today it attracts a huge number of recreational boaters and paddlers. 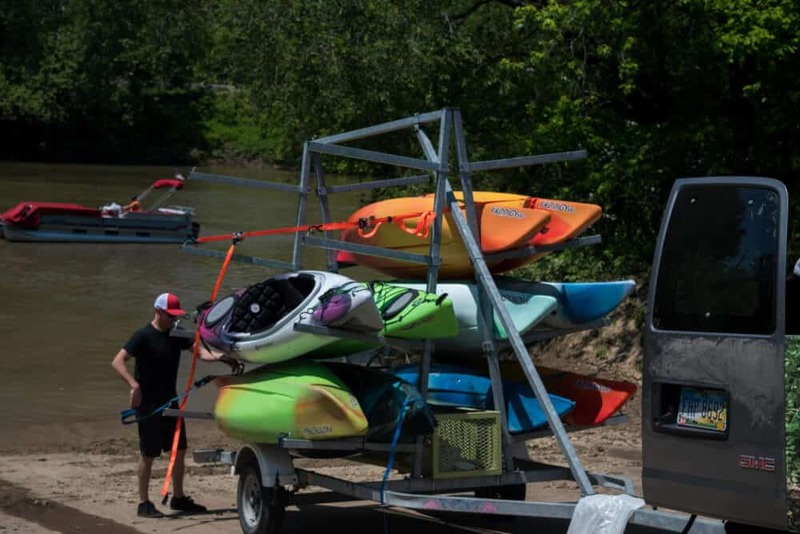 Marietta Adventure Company provides kayak rentals and a shuttle service to get you out on the water quickly without worrying about transporting boats to and from your adventure. From short paddles, lasting one to two hours, to full day or overnight adventures, there’s a stretch of river that is perfect for you. If you want a more personalized adventure, I suggest checking out the guided tours. 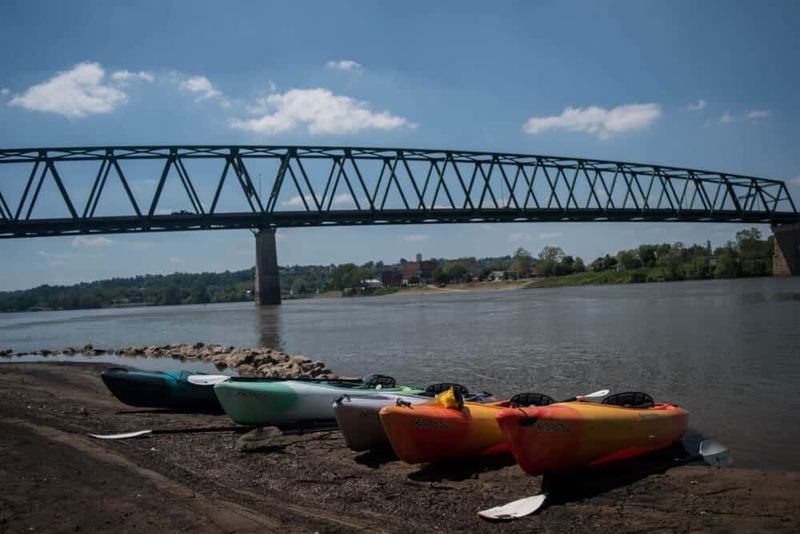 The folks at Marietta Adventure Company offer sunset (their most popular tour) and full moon paddles, as well as an awesome tour of the historic locks on the Muskingum River. You can also work with them to design your own tour to match your interests and level of expertise. Our group took a short guided paddle starting from Indian Acres on the Muskingum River and ending across the Ohio River in West Virginia. One highlight was getting a fish-eye view of the stately W.P. 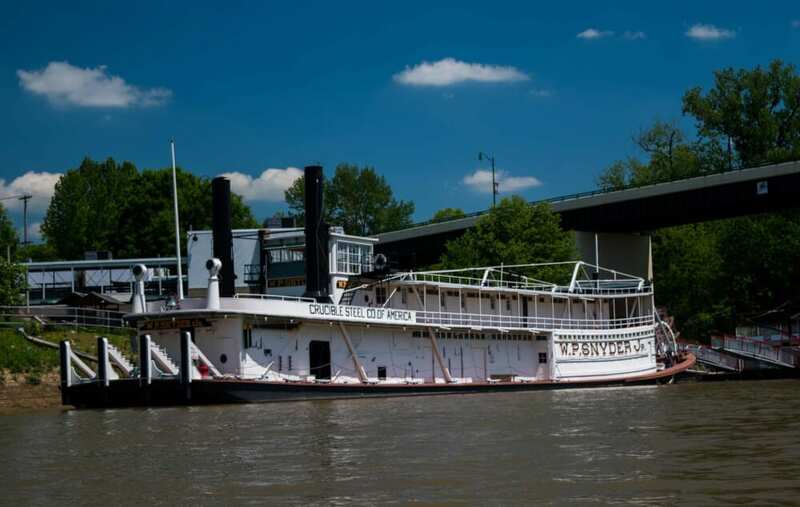 Snyder Jr., a steam-powered, sternwheel towboat, which is the last of its kind, at least in the United States. For a more in-depth tour of this restored historical landmark, you have to visit the Ohio River Museum on Front Street. After paddling under under several bridges and a smiling, Midwestern sun for a couple of hours we were ready to stretch our legs. We beached the kayaks on Buckley Island, which is actually in West Virginia and learned a bit about its sordid past. The 3.5-mile long island is part of the Ohio River Islands National Wildlife Refuge. The island is completely forested, and is an important habitat for migrating and nesting birds, as well as several species of endangered freshwater mussels. That wasn’t always the case, though. Since European settlers came to the area, Buckley Island has been home to an amusement park, a working farm, and a sanitarium known as the Pestilence House, where chronically ill and diseased patients were sent to recover, or more often, to die. We wandered around a bit and admired the views of Marietta, but I’d love to explore more of Buckley Island. Marietta has a thoroughly walkable downtown, allowing visitors to take advantage of dining, lodging, shopping, and cultural attractions without getting into their car. If you want to explore a little farther afield and get a nice workout, I urge you to consider biking around town. Bring your own, or pop into Marietta Adventure Company and rent a bike and helmet for the day. 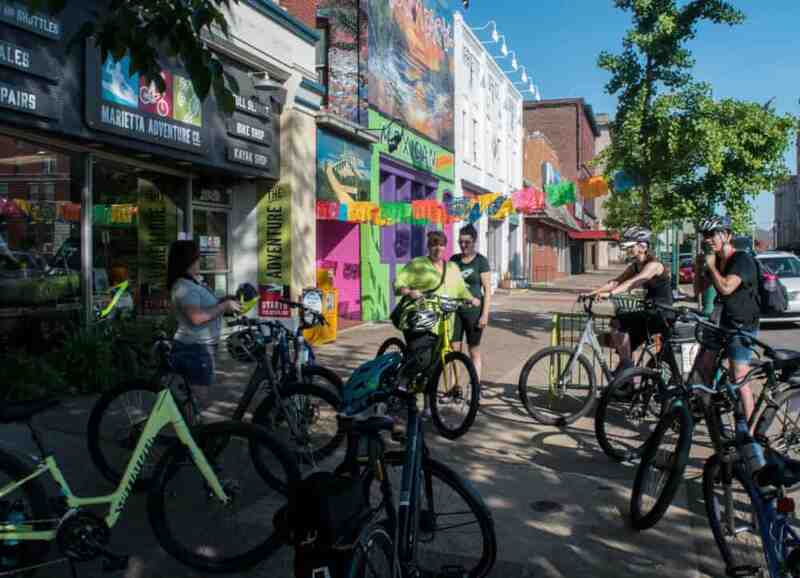 Our group was lucky enough to score a guided bike tour around town, thanks to Hallie, and while these aren’t offered to the public just yet, there was lots of talk about adding a guided bike tour to the summer line-up. In the meantime, head over to Marietta’s official website and check out their awesome self-guided walking tours, which can easily become bike tours. The self-guided tours are an awesome way to explore all kinds of hidden gems in Marietta. They’ve outlined a historic homes tour, churches, ancient earthworks, military relics, and covered bridges. Riverfront Bike Path – Journey 3.5 miles on a paved path that hugs the Muskingum and Ohio Rivers. This is a thoroughly delightful ride with fabulous views. 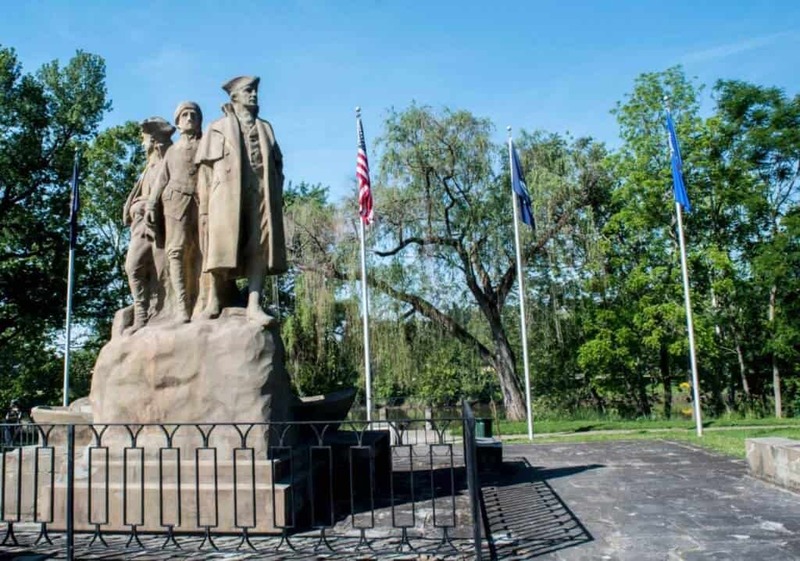 Ancient Earthworks and Mound Cemetery – More than 2000 years ago, the Adena people built ceremonial roads, mounds, and burial grounds in what is now Marietta. 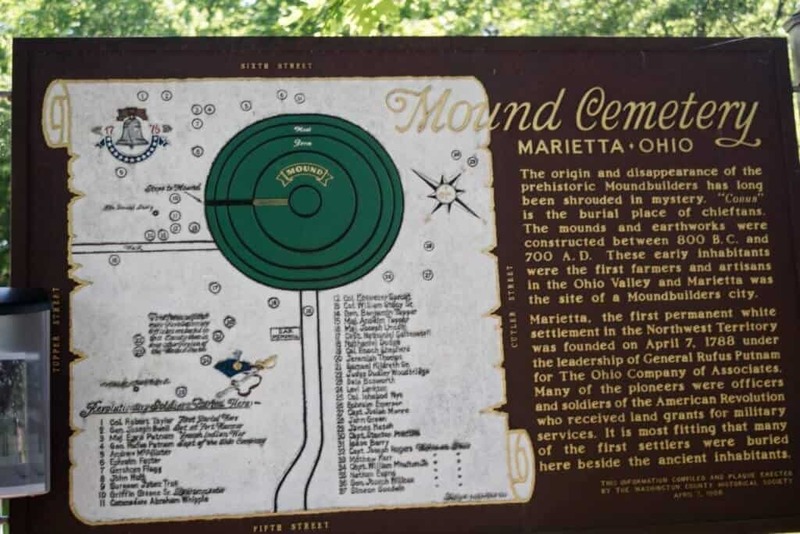 Mound Cemetery was built by Marietta’s founders around the original Adena burial mound. There are steps leading to the top of the mound, and the cemetery contains the graves of 37 Revolutionary War veterans. Memorial to the Start Westward of the United States – Located right of the bike path on the Muskingum River, this iconic local state commemorates the beginning of westward expansion in the United States. It was carved by Gutzon Borglum, who later went on to carve Mt. Rushmore. The statue was dedicated in 1938 by president Franklin D. Roosevelt. Marietta College – Your bike ride won’t be complete unless you take a spin through the 90-acre campus of Marietta College. With tree-lined streets, and lovely brick buildings, and plenty of spots to relax with a picnic. You don’t have to stick to the roads to enjoy downtown Marietta. The Marietta City Trail Network includes 30 miles of groomed singletrack for all levels of mountain biking and hiking. 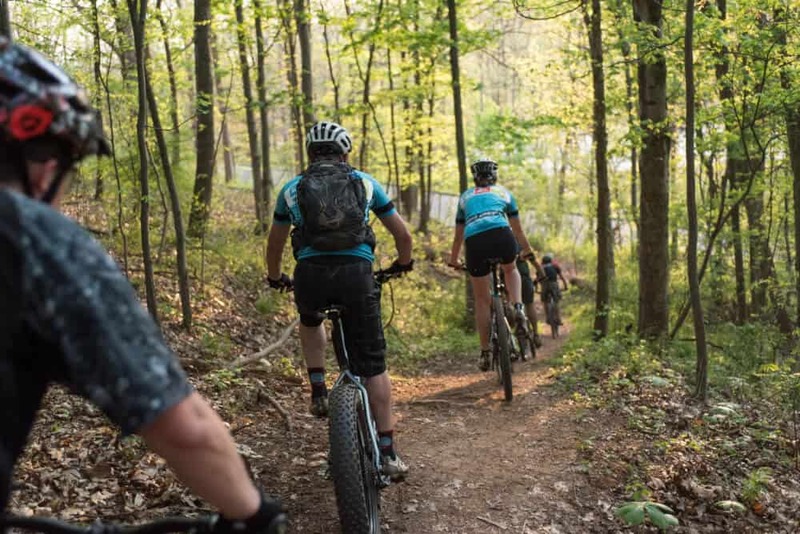 According to Ryan, of Marietta Adventure Company, Marietta has more miles of mountain biking and hiking trails than anywhere else in the state. Not sure where to begin? Check out the trail map to plan your route, or pop into Marietta Adventure Company for some advice. Our short foray onto the Marietta trails took us on the Chimney Trail and Lookout Loop. After meandering in the woods for awhile, I even forgot that we were within city limits. We spotted lots of wildflowers, a tiny bit of poison ivy, and a turtle trying to blend in with his surroundings. The views from the top of lookout loop were impressive, reminding us that, despite our wilderness surroundings, we’re still in the city. 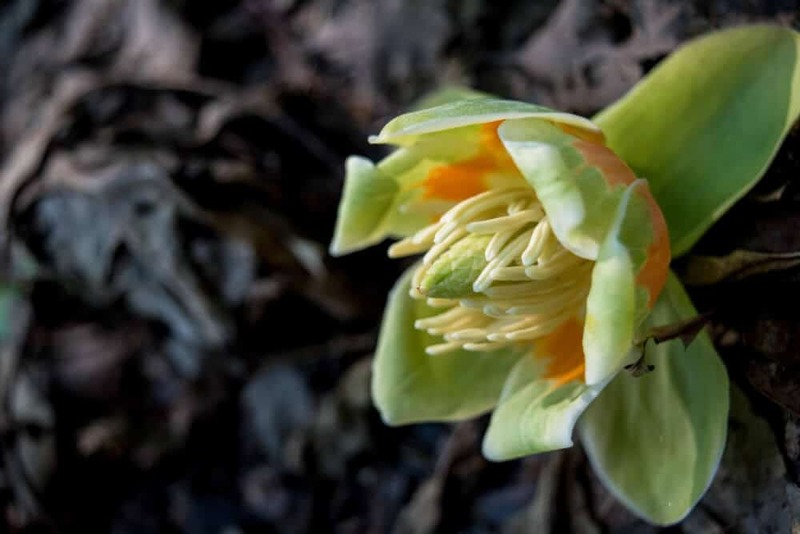 The Wayne National Forest covers more than a 250,000 acres in the Appalachian Foothills of Southeastern Ohio. Within this gem of a wilderness, you’ll find 300 miles of trails, several covered bridges, five campgrounds, and an elaborate series of waterways for all kinds of recreational opportunities. There is seriously so much exploring to do in the Wayne National Forest, that I’ve got to plan a whole new adventure. Our day hike did allow us to explore a the so-called “Great Cave,” which was more of an overhang, but still really cool, the Hune Covered Bridge, and the Irish Run Natural Bridge. Because we hiked on a warm day in May, it was awesome to be trekking through the forest, which was a good 5 degrees cooler than the open areas. The natural bridge was particularly lovely – it’s one of the largest natural bridges in Ohio, at 51 feet long and 39 feet high. You can walk across it (we didn’t) or underneath it via a short, but steep trail. It was delightfully cooler under the bridge — a perfect picnic spot on a warm summer day. You can actually, continue on this trail for another nine miles, looping back to your car. We basically returned the way we came, which brought our hike to about 3 miles. Marietta/Washington County Convention and Visitors Bureau – Located right downtown at 119 Greene Street, this is definitely the place to go to learn about attractions, events, and tours. Marietta Adventure Company – As I’ve already mentioned, these guys are your link to the outdoors in Marietta. The whole crew is more than happy to answer your questions or help you plan your adventures. Lafayette Hotel – I’m a sucker for historic hotels, especially if they’re right downtown. The Lafayette is a gem — it overlooks the river, the beds are comfortable (very important), and the staff is super friendly. Oh, and the prices are totally reasonable, with most rooms falling well under $100, even on the weekends. 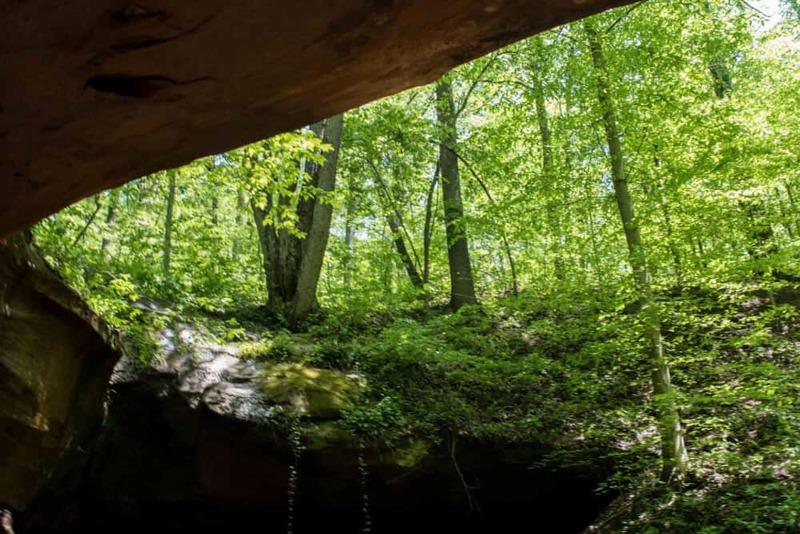 Wayne National Forest – For camping, hiking, and backpacking information, check out the website for Wayne National Forest. Very nice pictures. The Westward Movement monument was not dedicated by Theodore Roosevelt, but by his cousin, Franklin D. Roosevelt. Teddy died in 1919. The dedication was in 1938. Thank you so much for taking the time to comment. I don’t know how I missed that, but I made the change. Have a great day! The mounds are actually Hopewell, not Adena. Having lived in Charleston WV for the majority of my life, I am very familiar with Marietta and used to visit there quite frequently. I love seeing these press trips taking place and so many travel bloggers finding unique stories about it. Memorial to the Start Westward of the United States is one of my fave things to see in Marietta and of course staying at the Lafayette Hotel. 😉 Your kayak adventure looked fun! This is excellent! As a fellow small stater (Iowa), I love seeing travel stories from places not necessarily frequented. I’d love to do one of those full moon guided kayak trips! I’ve always wanted to do one of those and have never had the opportunity to. I also think cycling is one of the best ways possible to see a new city or region! The Wayne National Forest looks and sounds stunning and a great place to be one with nature! I love both kayaking and biking, so this way of seeing the area around Marietta is perfect. I would love to be out on that water right now! How fun. I have a friend in Ohio (Cleveland) so I just found the perfect excuse to visit her, he hee. I like all your proposals but I would pick for sure the paddling and some hiking. This looks great, would love to do the mountain biking or hiking trails. Kayaking and cycling are my two fav activities. Had a lot of fun in Krabi few months back. We’re always on the look out for quirky little towns off the tourist trail. With plenty of adventure activities Marietta looks perfect! Thanks for sharing! There are so many blogs about Paris and London that it is refreshing to hear about the smaller and lesser known places like this. Sounds like a great place for outdoor adventure and the story of Buckley Island is interesting and made a great place for a stop.